1. Preheat the oven to 200°C, gas mark 6. Heat the butter in a large frying pan until foaming. Add the onion and cook for 5 minutes until soft, then stir in the chilli flakes. Turn up the heat and add the kale, cooking for 5 minutes until glossy and wilted. 2. Meanwhile bring a pan of water to the boil and blanch the caulifl ower for 4 - 5 minutes. Drain, then add to the pan with the kale. Stir in the four cheese sauce, tossing everything together. Season and transfer to an ovenproof dish. You can freeze the dish at this stage, letting it cool to room temperature first. 3. If cooking from frozen, defrost the dish overnight in the fridge or using a microwave. 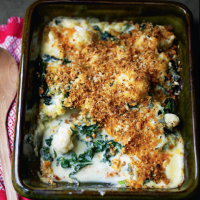 Mix the breadcrumbs, crushed garlic, paprika and olive oil and sprinkle over the caulifl ower and kale. Bake for 20 - 25 minutes until golden and bubbling, then allow to cool a little before serving with a green salad, if liked.